Jazzart Dance Show "Waiting for Rain"
Cape Town Jazzart premieres "Waiting for Rain" at Artscape on September 16, 2011. Contemporary dance at its most compelling will be showcased in Jazzart Dance Theatre’s latest full-length work, Waiting for Rain. Waiting for Rain features Jazzart’s trademark fusion of contemporary dance genres performed with their celebrated mix of athleticism and technical prowess. What is Jazzart Dance Theatre? Jazzart is Cape Town’s oldest Dance Company. They stage various dance shows throughout the year, with Danscape in July being a platform for up and coming dancers and choreographers to showcase their talent. 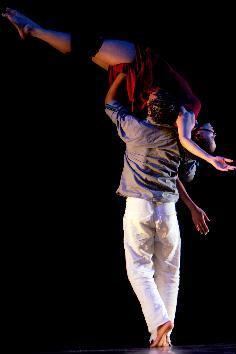 This Cape Town dance company offers various dance classes to the public and has got a tremendous outreach programme. Jazzart also offers a three year training programme for aspiring dancers. At the end of a three-year trainee programme at Cape town Jazzart, the graduating class collaborates with the company dancers for their graduation performance which is bringing this year’s performance of "Waiting for Rain". As a former member of Jazzart's company, Manyaapelo, who is now Jazzart’s artistic director, says working with a new generation of dancers has been both challenging and invigorating. The Cape Town Jazzart dance show "Waiting for Rain" will be danced by members of the company and graduates from the third-year class of Jazzart Young Adult Training and Job Creation Programme to a combination of live and recorded music composed by Thandile Mandela and Mthwakazi and performed under the musical direction of Ntone Edjabe. The dances in the show are choreographed by Mziyanda Mancam, Ina Wichterich-Mogane and Jacqueline Manyaapelo. In "Waiting for Rain" 22 dancers are fighting fit and ready to give the performance of a lifetime. "We would like the audience to leave with a sense of journeying with us in the new direction that we’re headed, as well as affirming a belief in our training and performance." Manyaapelo says. "Over and above that, we want the audience to be transported and moved by the stories told by our dancers and their bodies." According to Jazzart, the premise for the full-length work was based on the idea of rain symbolising rebirth. "As Jazzart, we would like to attempt to be "Rainmakers', as it were. We are excited by the way this new work has evolved and believe it signifies new life and a release of both artistic and emotional energy." This year's dance show marks the third time Thandile Mandela has performed a live musical score for the company. Mandela, who holds a Masters in African Music from UCT, has gained international renown for her knowledge of traditional music and her ability to master a wide range of instruments. Mthwakazi is known for her ethereal, yet earthy, vocals and is also no stranger to Jazzart, having appeared in one of the company’s seminal works, Guardian of the Flame. She has performed throughout South Africa, as well as in London and Paris. "We are incredibly excited about performing to Thandile and Mthwakazi’s evocative and soulful music. The chance to perform to their live music is a privilege and also brings a different energy that helps connect the dancers to the audience," says Manyaapelo. Sunday, September 18 at 18.00h. Further performances take place at 20h15 on September 21 and 22.